A ceremony was held in Dematagoda last week to distribute application forms to obtain housing loans from the Housing and Development Authority in keeping with a concept of Housing and Construction Minister Sajith Premadasa. At this first grama niladhari division level ceremony, the UNP’s Borella electorate chief organiser Jayantha de Silva participated as chief guest. 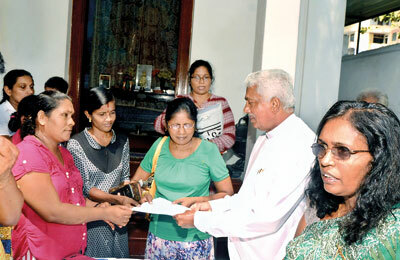 He is seen here handing over an application form to a Dematagoda resident.